Added option to filter by filename wildcard (In 'Advanced Options' window - F9). Added command-line options to save the report of FileActivityWatch into a file without displaying any user interface. Added 'Automatically Scroll Down On New Items' option. Added new columns: 'Read+Write Bytes' and 'Read+Write Count'. 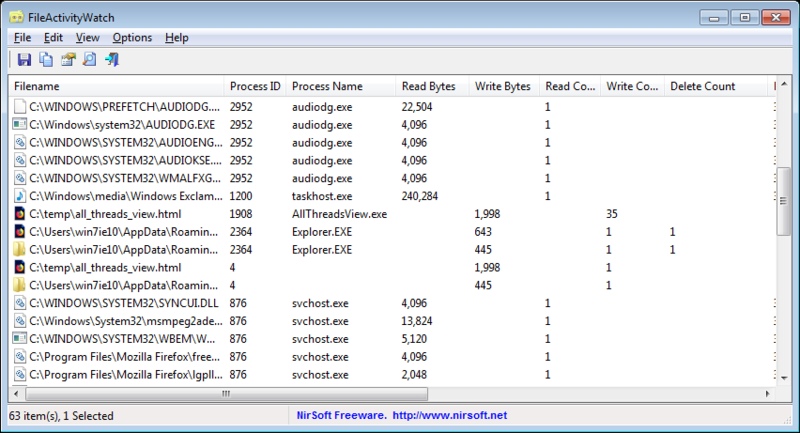 This tool cannot detect read/write activity if the file was opened white the tool was not running. Immediately after running FileActivityWatch, the main window displays all read/write/delete operations made by applications running on your system. Under the Options menu you can choose which type of operation to trace: 'Capture Read Events', 'Capture Write Events', and 'Capture Delete Events'. You can also turn off all events tracing by unchecking the 'Capture Events' option (F2). At any time, you can press Ctrl+X (Clear List) in order to clear all items accumulated in the main window of FileActivityWatch. Filename:The filename that had read/write/delete operation. Process ID:The ID of the process responsible for the read/write/delete operation. Process Name:The name of the process responsible for the read/write/delete operation. Process Path:Full path of the process. Read Count:Number of read operations. Write Count:Number of write operations. Delete Count:Number of times that the file was deleted by the specified process. Read Bytes:Total number of bytes read from the specified file by the specified process. Write Bytes:Total number of bytes written to the specified file by the specified process. First Read Time:Date/time when the first read operation was detected. First Write Time:Date/time when the first write operation was detected. Last Read Time:Date/time when the last read operation was detected. Last Write Time:Date/time when the last write operation was detected. /stext <Filename> Save the report of FileActivityWatch into a simple text file. /stab <Filename> Save the report of FileActivityWatch into a tab-delimited text file. /scomma <Filename> Save the report of FileActivityWatch into a comma-delimited text file (csv). /shtml <Filename> Save the report of FileActivityWatch into HTML file (Horizontal). /sverhtml <Filename> Save the report of FileActivityWatch into HTML file (Vertical). /sxml <Filename> Save the report of FileActivityWatch into XML file. /sjson <Filename> Save the report of FileActivityWatch into JSON file. /sort <column> This command-line option can be used with other save options for sorting by the desired column. The <column> parameter can specify the column index (0 for the first column, 1 for the second column, and so on) or the name of the column, like "Filename" and "Process Name". You can specify the '~' prefix character (e.g: "~Write Bytes") if you want to sort in descending order. You can put multiple /sort in the command-line if you want to sort by multiple columns. A file named FileActivityWatch_lng.ini will be created in the folder of FileActivityWatch utility. After you finish the translation, Run FileActivityWatch, and all translated strings will be loaded from the language file. If you want to run FileActivityWatch without the translation, simply rename the language file, or move it to another folder. FileActivityWatch is also available in other languages. In order to change the language of FileActivityWatch, download the appropriate language zip file, extract the 'fileactivitywatch_lng.ini', and put it in the same folder that you Installed FileActivityWatch utility.